Don't vape on an inferior coil, this is an authentic replacement pack of Triton Tank coils. Keep your vape fresh and your flavor as pure as possible by replacing your coils regularly. Keep your tank vaping with the highest quality of flavor possible with some fresh coils from Aspire. 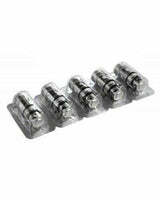 Triton Replacement Coils (5 Pack) - Aspire has a rating of 5.0 stars based on 1 reviews.